Floating 320mm flame design front rotor, thickness 5mm with anodized orange carrier. Moto-Master's championship winning supermoto race rotors are made out of a zinc coated chrome-molybdenium alloy. This exclusive alloy ensures optimal friction without fading at high temperatures. The flame design provides extra cooling and cleans the whole of brakepad surface without tilting of the pads. Special heat treatment and prescision grinding prevents deformation of rotor and gives perfect control in extreme race conditions. Caliper kit includes caliper, adapter bracket, mounting bolts and racing compound pads. This compact sized 4-piston caliper is especially developed for Supermoto racing and is made of billet CNC machined aluminum. 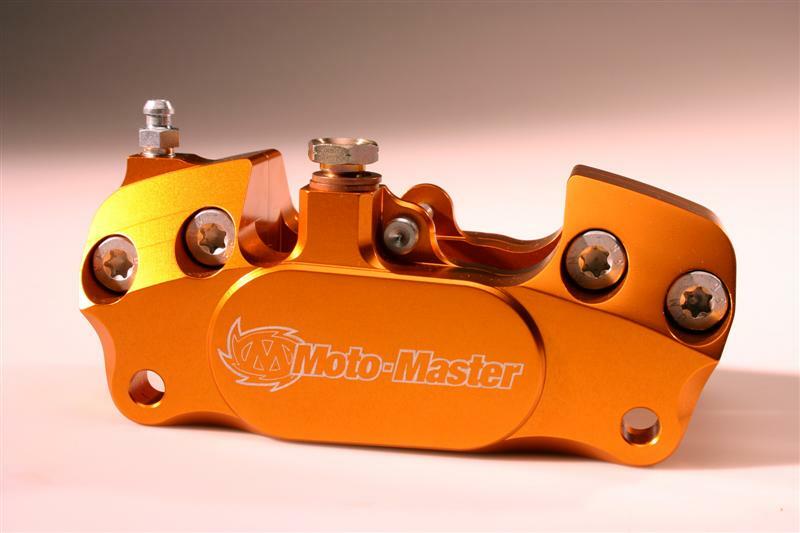 It is Moto-Master-orange anodized to perfectly match the Supermoto race rotors. Allows use of stock brake pump. Soft compound racing compound pads that provide excellent initial bite and superior thermal resistance. Designed for professional supermoto racing conditions.